Happy Friday! This Friday, all of you are in for a special treat! Not only are we talking about how to use gold in interiors but we will be releasing not one but two how-to videos! This particular video is all about the bold use of gold! Gold is making a comeback! We are seeing it in accessories on the runway AND in interior design and home furnishings. Gold is a bold and glorious neutral, that looks amazing with taupe, white and black. It can also be mixed with bright bold colors such as orange, turquoise and red. So what decorating colors go with gold? I say nearly anything goes. Adding gold to a room can really add a sense of warmth and coziness to a space. Decorating With Black & White: NYC Celebrity Interior Designer Cathy Hobbs Shares 7 Tips On Designing With The Popular Colors With Cotton Candy Magazine! 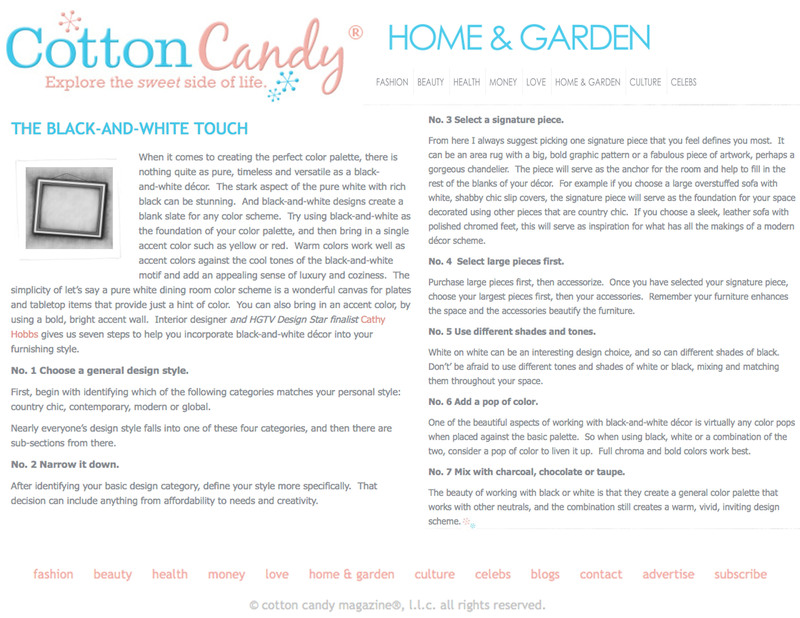 ≈ Comments Off on Decorating With Black & White: NYC Celebrity Interior Designer Cathy Hobbs Shares 7 Tips On Designing With The Popular Colors With Cotton Candy Magazine! When it comes to creating the perfect color palette, there is nothing quite as pure, timeless and versatile as decorating using black and white. Black and white simply serves as the perfect “blank slate” for creating virtually any color scheme you desire. First and foremost don’t be afraid to a simple all white color palette, as it can be crisp and fresh, the simplicity of let’s say a pure white dining room color scheme in which the plates and tabletop items provide the hint of color (as opposed to using the traditional pure white). Also open yourself to the possibility of creating a pure black and white palette; the stark aspect of the pure white with the rich black can really be stunning. What I tend to do most however, is use black and white as the foundation of my color palette and then bring in a single accent color such as yellow or red. Warm colors work really well as accent colors against the cool tones of the black and white and really add an appealing sense of luxury and coziness. Also, don’t be afraid to bring in an accent color, by using an accent wall, some of my most successful designs ever; have involved the use of pure white furniture or a white and black color scheme, highlighted by a bright, bold accent wall! So where do you start? And most importantly how do you go about selecting those black and white pieces that define your design style? 7 ways to incorporate black and white into your décor..
First! Begin with identifying whether your personal style falls into one of these four categories. I find that nearly everyone’s design style falls into one of these four categories and then there are sub-sections from there. After identifying your basic design category, now it is time to narrow it down a little bit more and define your style more specifically. From here I always suggest picking one signature piece that you feel defines you most. It can be an area rug with a big, bold graphic pattern or a fabulous piece of artwork or a gorgeous chandelier. Whatever piece you choose it will serve as the anchor for the room and help to fill in the rest of the blanks of your décor. For example if you choose a large overstuffed sofa with white “Shabby Chic” slip covers, it will serve as the foundation for your space decorated using other pieces that are “Country chic”. Conversely, if you choose a sleek, leather sofa with polished chromed feet, this will serve as inspiration for what has all the makings of a modern décor scheme. Step 4- Select large pieces first! Purchase large pieces first then accessorize. Once you have selected your signature piece that you feel best represents your personal taste and style, allow it to serve as your inspiration. From there choose your largest pieces first then your accessories. Remember your furniture enhances the space and the accessories enhance the furniture. White on white can be a really interesting design choice so can different shades of black. Don’t’ be afraid to use different tones and shades of white or black, mixing and matching them throughout your space. One of the beautiful aspects of working with black and white is the fact that it is really a blank canvas. Virtually any color “pops” when placed against black or white. So when using black or white or a combination of the two, why not consider a pop of color to liven it up. Full chroma, bold colors work best. The beauty of working with black and white is that it creates a general enough color palette that you can use it with other so called neutrals and still create a warm, vivid and inviting design scheme.